COMMUNAL ENTRANCE HALL: Lift access to the 4th Floor. ENTRANCE HALLWAY: Video entry phone system and storage cupboard. OPEN PLAN LIVING / DINING ROOM AREA: Access to a private balcony. KITCHEN AREA: Range of fitted wall and base units with work surfaces over, inset stainless steel sink, integrated electric oven and four ring hob with extractor hood over, fridge/freezer, dishwasher and washer dryer and vinyl flooring. MASTER BEDROOM: Window to side. Built in wardrobe and access to the balcony. EN-SUITE SHOWER ROOM: A white suite comprising of a shower cubicle, pedestal wash hand basin, low level WC and vinyl flooring. 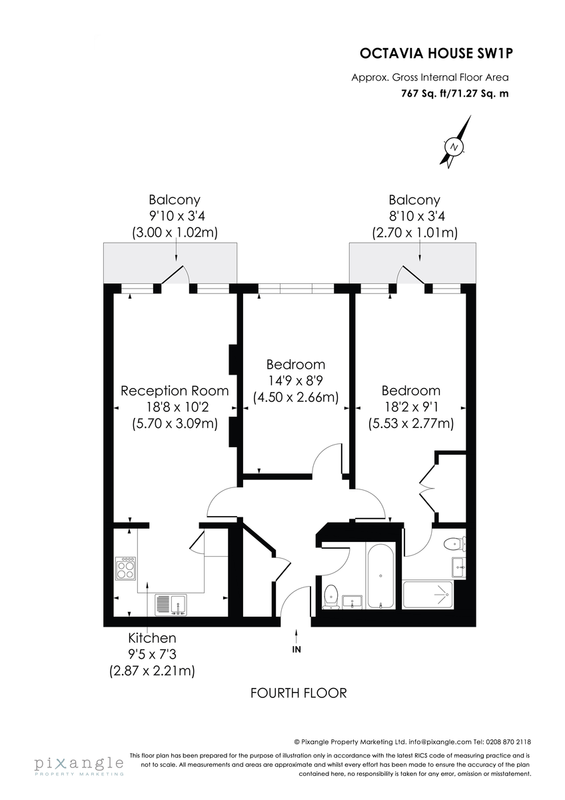 SECOND DOUBLE BEDROOM: Window to side. FAMILY BATHROOM: A white suite comprising of a panelled bath with shower attachment, pedestal wash hand basin, low level WC and vinyl flooring. EXTERIOR: Outside there is an underground allocated parking space. SITUATION: The development is exceptionally well located for easy access to St James' Park and Westminster Tube links. The surrounding area offers a variety of retail stores, including the flagship House of Fraser department store and the Cardinal Place Shopping Centre. The Quilon and Cinnamon Club compliment the extensive range of local restaurants.